In the Myers department store in Sydney’s CBD, I find the location of Cafe Victoria quite peculiar. In my mind the feminine touches, classical music and promises of High Tea would be more suitable to a clientele more predisposed to gowns and intimates rather than suits and shirts? Maybe it’s for weary girlfriends, partners and wives who are waiting for their other half to make a decision on whether to take the handkerchief or a tie to wear with their suit? The cafe in the corner of the menswear department has a cosy design but the pièce de résistance is the bar and stools running along the picture windows. I do love a view, and this city view looks straight across George and Market streets to the Queen Victoria Building and the busy intersection below. 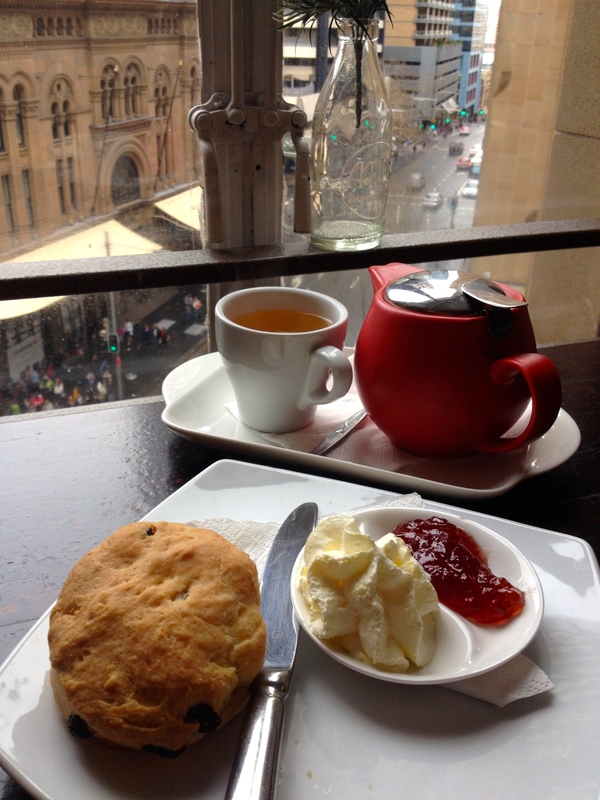 It’s obviously my lucky day as this is the first time I have seen scones available at this cafe. My sultana scone is, politely put, average, and quite hard on the outside. The small serving of ultra sweet jam and cream from a can is rather disappointing. The only worthy mention goes to the Tea Tonic tea and that city view! Tea: A selection of Tea Tonic loose-leaf teas served in a small pot. Overall: Take advantage of the windows and view, especially if you have been indoors for too long.